I knew that I was going to be getting a few machines - based on my rule of threes (three of any one thing is the minimum number you should have) - and I knew I dug early 1980's games, being that is when I grew up. What better way to get started than 1980's Firepower by Williams. After 1979's Flash, Williams needed another game that pushed the envelope and got Flash's creator, Steve Richie ( The King Of Flow) and their best programer, Eugene Jarvis, to make one of the best pins of all-time. 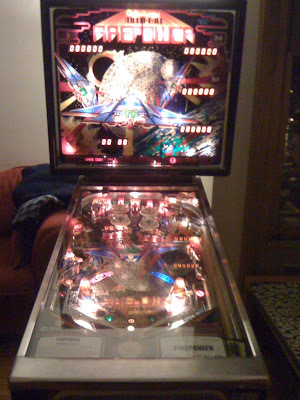 1980's Firepower was a return to multiball, but that may be the only old idea on the machine. The sounds are stellar, early electro gun sounds, explosions, bleeps and bloops and just awesome. The art package is very cool - sci-fi, slightly comic book style and even has a bit of a story - you are in a fire fight and need to take down the enemy ship, or ships. For the first time, the displays did something besides just display score - they counted down 9 to 1 when you locked the third ball for multiball. Which seems like a small thing now, but back in the day, even people inside at Williams were worried that when the display showed something besides the score, that the score might forever disappear. It didn't and its an awesome bit of showyness that makes getting multiball just so much fun. It's a really tough game, but super fun, fast and challenging. It's a great one to turn the volume up on and play for an hour and just immerse yourself in. So awesome. Man that table looks great with all the lights running. Oh yeah! That sounds dope. I will probably have to roll to that! Thanks for the heads up. 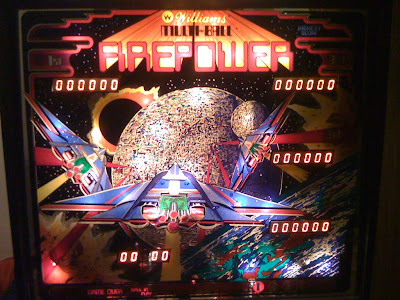 Although I prefer the Dot Matrix pinballs from the nineties I am thinking very hard about getting myself a Firepower pinball. Someone local is selling one. Would be my first pin and it would costs about 1/3 of a cheap nineties pinball. I have to say, it won't have the depth of a later DMD machine and will certainly lack things like modes and lots of speech. It does have fast, super fun play and can be super satisfying. Good thing about pinball - especially classics like Firepower - is that if you get bored and need to sell it, you won't have to take any sort of hit. Congrats on your new Dracula pin, awesome! And about not losing money when need to sell it, I had to keep myself thinking that when I bought my Ketsui board some months ago :) But won't ever sell it anyway.